(known as flagella) that help propel it through fluid. small to be seen without using a microscope. WHERE IS HELICOBACTER PYLORI USUALLY FOUND? shape to burrow through the mucous membrane like a corkscrew. group of chemical substances that form proteins. colorless gas that dissolves in water to form a liquid that is less acidic. which can reproduce inside the mucous membrane. Helicobacter pylori is also found on epithelial cells in the stomach and in the first part of the intestine. Epithelial cells are cells that help absorb, move, and distribute some of the fluids and nutrients in the body. are glands in the stomach that produce stomach juices. WHAT ARE SIGNS AND SYMPTOMS OF HELICOBACTER PYLORI INFECTION? toxins (poisons) that are harmful to cells (although some do). stomach rather than directly caused by the Helicobacter pylori. pylori is usually found in the mucous membranes of the stomach. proteins, fats, and white blood cells (which help the body fight off diseases). adenocarcinoma. An adenocarcinoma is a type of cancer that involves the epithelial cells of glands. Epithelia cells are cells that help absorb, move, and distribute some of the fluids and nutrients in the body. 1% going on to develop stomach cancer. substance released from the liver that carries away waste products. Some have suggested that Helicobacter pylori may be a factor in Sudden Infant Death Syndrome (SIDS). SIDS is the sudden death of a healthy infant after all known causes have been ruled out. HOW DOES HELICOBACTER PYLORI CAUSE PROBLEMS? Some types (about 50%) of Helicobacter pylori contain substances that are toxic (poisonous) to cells. causes the stomach to decrease in size. stomach may lead to ulcer formation. HOW COMMON IS HELICOBACTER PYLORI INFECTION? million visits to the doctor each year. WHO GETS HELICOBACTER PYLORI INFECTIONS? people, and poor people have been attributed to social rather than biological causes. HOW IS HELICOBACTER PYLORI SPREAD? it. If the feces wind up contaminating food or water, it can be eaten by accident and the bacteria spreads. people, so this explanation seems plausible. afterwards, it can contaminate other patients in whom the endoscope is used on afterwards. 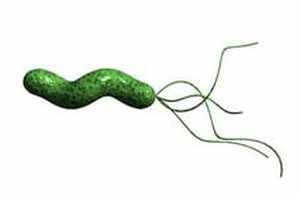 CAN HELICOBACTER PYLORI BE PREVENTED? from a clean source, and to wash your hands thoroughly throughout the day. HOW IS HELICOBACTER PYLORI DIAGNOSED? the smallest part of an element that can exist alone or in combination with something else. actions in cells that release energy from nutrients or use energy to create other substances. the capsule that contained radioactivity). If the carbon dioxide level raises above a set amount, Helicobacter pylori is determined to be present. is about 96 to 98% accurate. The problem is that not many centers have this test available. Doctors may also look for specific antigens formed by the body in response to Helicobacter pylori. pylori. This test is called the Helicobacter pylori stool antigen (HpSA) test and it is considered accurate. food down into the stomach after it is swallowed. sample. This is the most accepted way to diagnose Helicobacter pylori once a tissue sample is collected. Another test that can be performed when the tissue sample is collected is known as the rapid urease test. pylori is considered to be present. HOW IS HELICOBACTER PYLORI TREATED? used to treat Helicobacter pylori are metronidazole, clarithomycin, tetracycline, and amoxicillin. protecting the stomach lining. Antacids, such as Tums or Rolaids can relive symptoms of ulcers. and nizatidine (Axid). They help decrease pain from ulcers in a few weeks. lansoprazole (Prevacid), rabeprazole (AcipHex), esomeprazole (Nexium), and pantoprazole (Protonix). antibiotics are needed as well. therapy usually lasts for 10 days to 2 weeks. doctors wait 6months before retesting the patient. WHAT IS THE PROGNOSIS FOR PEOPLE WITH HELICOBACTER PYLORI? dangerous, as represented by the fact that it causes approximately 16,000 deaths every year. 11 patients with chronic (long-term) stomach inflammation. HOW IS HELICOBACTER PYLORI ABBREVIATED? Helicobacter pylori is commonly abbreviated in medical charts as H. pylori. WHAT ELSE IS HELICOBACTER PYLORI KNOWN AS? was appropriately classified as a species of Helicobacter in 1989. WHAT IS THE ORIGIN OF THE TERM, HELICOBACTER PYLORI? words together and you have "coil(ed) small staff gate guard."